I have just revised the post I wrote on the Sandown, NH, Meeting House. I have learned a lot more about early New England geometry since I wrote about Sandown in February. I have been in the Sandown Meeting House, sat in the pews, climbed among the trusses, stood at the lectern in the pulpit. I have visited and explored the geometry of the Parson Capen House, 1683; and the Rockingham, VT, Meeting House, 1785-1800. I am reading Palladio's 4 Books. I revisited the Sandown measured drawings, found simpler, cleaner geometries which could have been employed. A new post would have let the old diagrams remain. They are better discarded. I really didn't want anyone to come across the old post through an internet search. So I redrew and rewrote it. People had looked at that post 84 times before I revised. If you are one, please go back and read the new version. 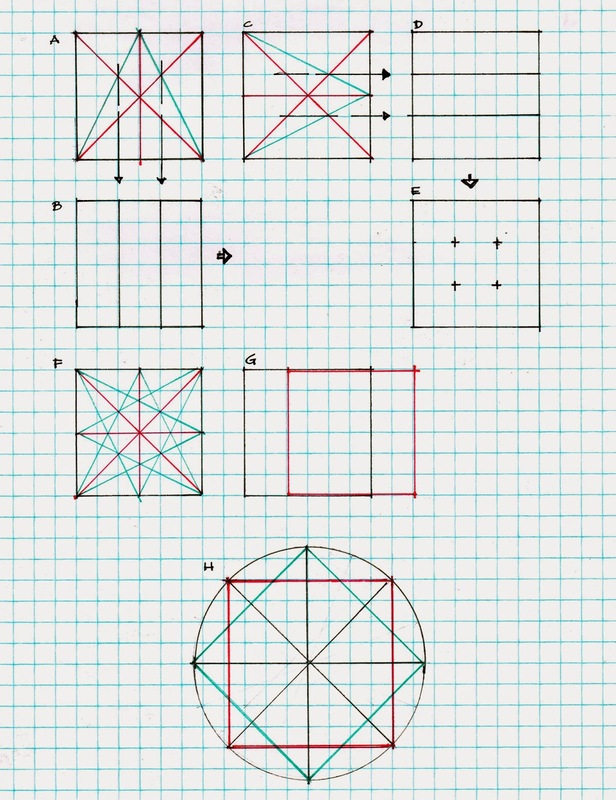 - How to divide a square into halves; more importantly, why. 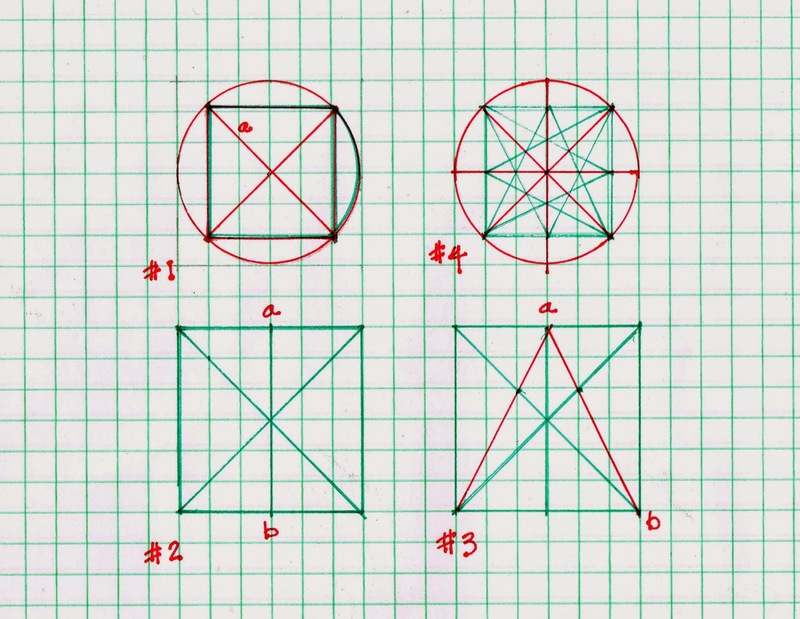 Follow the progression on the graph paper here: #1-#2-#3-#4 - counter-clockwise. I saw how that geometry informed the Parson Capen House. - What patterns happen when the square in question is divided both horizontally and vertically - see A, B, C, D, E.
- And all the diagonals added. - And then, imagine 2 squares overlapping! Since this happens at all 3 of the meeting houses I've studied, I needed to think about it more carefully - see F, G.
- And if overlapping is reasonable, how about turning the square 45*, on its point? See H. The circle surrounding the square is really unnecessary, and, I think, probably not used. Imagine G or H with all its diagonals as in F! I presented some of that in my diagram for the doors of the Rockingham Meeting House. Finally I have been trying to understand the influence of Palladio on American vernacular architecture before the 1820's in terms of geometry. We seem to use squares as a base in New England, and daisy wheel circles in New York. We use 3-4-5 triangles, especially when building an addition. About 1800 the more urban builders seem to begin to explore the Golden Section and less traditional ways to use geometry. Currently, I do not see builders north of Boston using circles before 1790. And I will now be skeptical when I see what appears to be a Golden Section. The turned square - H above - uses diagonals just as does the Golden Section. But within the confines of the square, not as an extension.